Andy thanks for agreeing to this interview. Perhaps the first thing you could talk about is your involvement with whisky. What’s been your history so far? Highlands and Auchentoshan the only Scottish tripled distilled whisky in the Lowlands. I then moved to Wellington to the distillery here where from 1989 onwards they established it as the home of South African whisky. 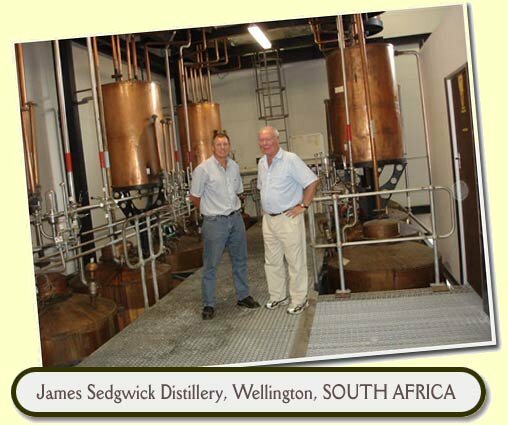 Our operations before that used to be in Stellenbosch at a small distillery called R&B and when the lease expired we moved the whole operation across to Welllington and since 1989 I have managed this site and headed up the production of Three Ships. The website states that the Three Ships brand was actually launched as far back as 1977. What happened before you got here? That’s right. In 1977 Three Ships was launched under the marketing skills of Mr Francis Norton an extremely mad Irishman with a passion for whisky but in 1977 when it was launched it wasn’t actually a fully fledged whisky because it contained matured Scottish malt whisky and unmatured South African grain whisky. It was only in 1981 that Three Ships became a fully fledged whisky meaning that both the grain and malt components had now matured for the minimum legislated period of 3 years. Your website also says, talking now about the Single Malt, it is 100% natural – so you don’t add caramel? That’s correct. The single malt as you can see from the bottle here in front of you, the colour in that is totally natural. To be honest I don’t think so. The concentration of caramel is incredible; you need minute amounts to make the colour changes which you see in the bottle. I honestly do not believe it can change the quality or the taste of the whisky. I think that’s a personal one too. I see the trend overseas is to move away from that – they say it is not natural to chill filter – in other words they are prepared to see a slight haze in the product and then to make the statement that this is now a purely natural product that you see and no chill filtering has taken place. Chill filtration does take out some of the flavours there is no doubt about that but I think in this country, in South Africa at the moment our customers out there are used to seeing a clean clear product and I think if you were in Bloemfontein in the winter and suddenly your whisky turned hazy you would probably get it back as a customer complaint. I don’t yet think our consumer is educated at a level to understand chill filtration and what the benefits and possible disadvantages of it are. The barley came from mainland UK. This is an interesting question – because a lot of people ask if you bring in the barley from overseas how can it be South African? The whole definition of Scotch whisky and South African as well, is where the product is distilled and matured. In other words at the moment in Scotland it is possible, as a result of shortages, for the grain component to be French wheat and the barley could come from Holland. To give you an example up until the mid 1980’s I would go as far as to say that 95% of all the grain used in Scottish grain whisky originated from the maize fields of South Africa. We exported vast amounts of maize to Scotland for the whisky industry. So yes we import our barley from overseas for the simple reason that there is no barley in South Africa which is suitable for distillation purposes. All the barley in this country available for liquid use is used up by South African Breweries. That’s a good one. Joe as we discussed I have many plans but how many of them are going to get to the surface I really don’t know. But yes I’ve products which have been identified for future releases and I think in view of the success of the 10 yo SM it would be very short sighted if we did not follow on that success with something on a more continuous basis. I think the 6000 bottles which were made whetted the appetite of a lot of people out there and it would be nice to give those people something on a continuous basis. The next project I am looking at is something totally different. The reason is that way back in 1977 when the idea was first pioneered to make a South African whisky you would have been absolutely stupid to have considered anything other than Scottish style whisky. The simple reason being that 99% of all whisky consumed in South Africa at that stage was Scotch and that was the trend right the way through the mid-90’s until we became a part of the global village. I think over the last few years in the new market which has emerged, consumers who are now moving to whisky are much more susceptible to change, in other words it is not necessary now to have a whisky which definitely follows the Scottish style, the time could now be right to say this is something which has a South African style, something which is really unique to South Africa. So yes even though 60% of the whisky consumed in this country is of a Scotch style the other 40% is growing at an amazing rate and I think there is no reason at all why we can’t stand on our own feet and do something slightly different and really South African. For example if you decided to go 100% South African maize, I don’t think there is anybody else in the world who is doing that so yes you would have something there which is definitely unique to this country. If you look at bourbons for example they must contain by law a minimum of 51% corn which is maize, if you look at Scotland at the moment there is only one grain distillery which still uses maize, the rest use wheat. So yes there would definitely be licence to say that we could make something unique. That’s somewhere again where we are very unique in our distillery and you will see that when we take the walk through. We do not do our mashing the traditional way they do in Scotland. Our equipment is slightly different, in other words we actually mash solids in, the same as they do in Scotland but we don’t separate in a mashtun we have other methods of separation before going to our pots and then with the grain whisky that is a continuous process so there is no separation. That is correct. We work with two companies which are not part of the major stables, we’ve come a long way with Morrison’s as I have mentioned earlier and we also use Angus Dundee. Yes we do. Again I don’t think there are too many distilleries in the world which have got the capabilities of doing both grain and malt on the same site and what makes my job even more interesting is that where in a traditional or typical Scottish distillery you have a certain style of barley which you bring in and you produce that product day in and day out, I am in the position where if I want to bring in heavily peated malt and run that for two weeks I can and if I want to bring in unpeated malt I can do that as well. In other words I’ve got the whole spectrum which I can do here. I could not agree with you more Joe – again I am racked and stacked until that idea gets off the ground. We sit with an absolutely stunning premises, we are 40 minutes away from Cape Town, there isn’t another commercial distillery in the country, everything is in our favour to do something like that. You are 100% right but I can’t tell you when because I honestly don’t know.